I have in my hands an advance copy of the book "Food Sovereignty in Canada" put out by Fernwood Publishing. I am very proud! I would tell you exactly what I did for this book, but then my thin veneer of anonymity would be blown. I will say that I did copy-edit half of it, and did substantive editing for three of the chapters. Please don't tell me about any typos I missed. That was probably the other copy-editor. "The language of food sovereignty was initially introduced by La Via Campesina to express both the truth of power relations within the food domain and the hope for the democratic, widely dispersed, just distribution of those powers over food...In order to transform the dominant forces, including those related to politics, economics, gender, the environment and social organization, we need to be able to imagine and articulate new relationships to food, community and ultimately the earth." "Instead of the current construct of farmers producing and individual consumers buying food, where both the access to and production of food are determined by the market, food sovereignty begins from the position of citizens engaged in decisions about providing life-sustaining good food." 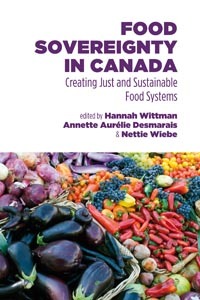 From the publisher: "Achieving food sovereignty requires conceptual and practical changes, reshaping menus, farming, communities, relationships, values and policy, but, as the authors clearly demonstrate, the urgent work of building food sovereignty in Canada is well under way." "Advancing Agriculture by Destroying Farms? The State of Agriculture in Canada"
"Indigenous Food Sovereignty: A Model for Social Learning"
"Growing Community: Community Gardens as a Local Practice of Food Sovereignty"
"Community Nutrition Practice and Research: Integrating a Good Sovereignty Approach"
"Transforming Agriculture: Women Farmers Define a Food sovereignty Policy for Canada"